Sadly but not surprisingly, Identity Politics has been mainstreamed in America. Of course that means that what now passes for large swaths of American society has to politicize Identity, else they have know agenda that can be enacted. And, of course, not all Identities can be allowed to be equal. 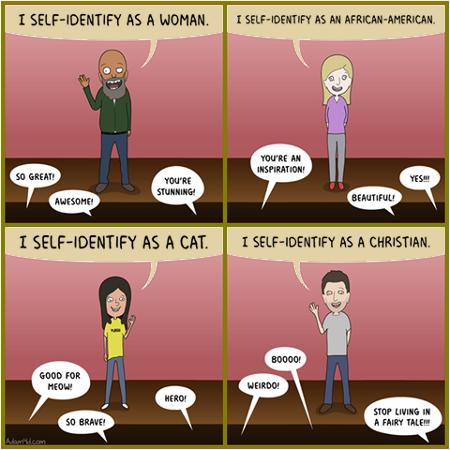 Some Identities, those that are normative or are associated with a long-standing moral thesis must be ridiculed, derided, and if at all possible marginalized in preparation for destruction. So yes, there’s a war on Christianity in America. Our nation’s domestic enemies want to silence Christians by punishing them for adhering to their faith. In essence, the Liberals and Progressives, along with the various non-normal minority groups that they enable and pander to, want to replace freedom of religion – when and only when it applies to Christians – with freedom of worship. The why of this is even more simple and horrid than the how of it. America’s domestic enemies want to change the very Identity of America. Periodically the news ripples slightly with news of federal agencies investigating Hillary Clinton and her staff about her use of an unsecured, private email server to conduct classified State Department business. Each time there’s a ripple various and sundry people rub their hands together and salivate, believing she’ll be indicted and possibly even convicted of one or more high crimes against America. Ah hope – it springs eternal in the breasts of men and is itself the wellspring of despair and disillusionment. In this case and in this time Hillary Clinton is untouchable. She’s got a get out jail free card. 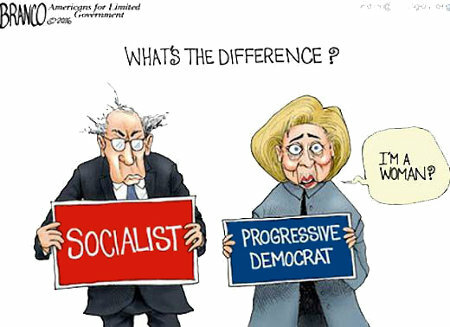 She’s not only a Democrat, she’s the in-all-but-name Democrat Nominee for the 2016 Presidential Election. 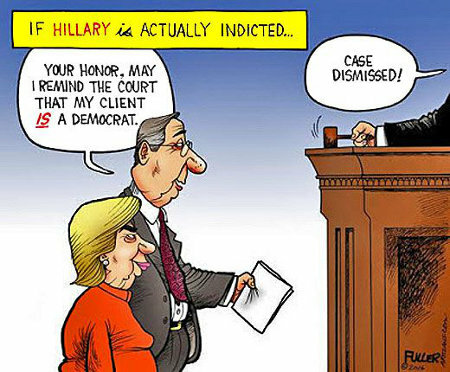 As every member of every agency that is supposedly investigating her is employed at the pleasure of Obama, Hillary will not be indicted until and unless a Republican is in the Oval Office. Really! Can anyone in America truly believe that Obama would allow such a thing to happen to Hillary? No matter whatever the boy’s personal feeling about the Clintons might be, he’d never scuttle the Dems’ best and only hope to keep the White House. Hillary could literally hold the young women down while Bill raped them and Obama would do his level best to not let it affect her campaign. Justice Scalia has passed over into death after just barely under 80 years on this Earth and 20 years of duty as an Associate Justice of the Supreme Court of the United States. He is said to have passed peacefully in his sleep after an afternoon of quail hunting and evening of fine dining at Texas’ famous Cibolo Creek Ranch. Truly, as last days in this life go, quail hunting and a great dinner is far, far, far from the worst one possible. It’s pleasing to know Justice Scalia got to enjoy such. Justice Scalia will certainly be missed by Americans, though the Liberals and Progressives are more likely to celebrate his death than to mourn it. 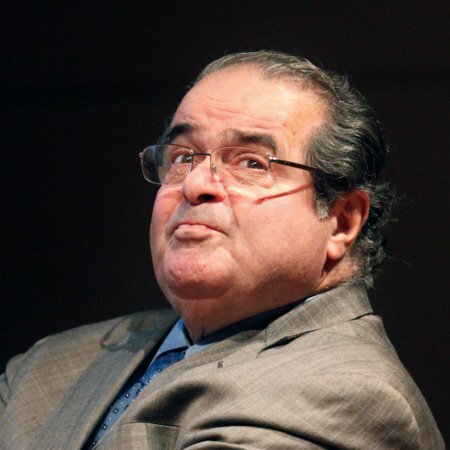 How much we, the People will lament Justice Scalia’s death remains to be seen. It will depend upon first whether or not Congress can block whoever Obama digs up as a replacement and secondly, assuming the first is successful, who is elected as the next POTUS in November. In other words, Ladies and Gentlemen of America, we’ve just been handed a truly grim reminder of just exactly how the upcoming Presidential election is existentially important to the future of our nation. Given that at the beginning of each new year many of us make various promises to ourselves – resolutions, if you will – to exercise more and, given that by this time our commitment to said resolutions are flagging, many of us need an injection of inspiration if we’re going to get over the hump and keep hitting the gym. And no! Lest those who know me and my professed predilections think that I’ve fallen to hypocrisy, I am well aware that these hardbodied babes more than likely merely present a better and healthier set of symptoms of the same mental disease that afflicts the fashion victims. Nor have my taste changed. I still prefer to live dangerously, with women of abundant and voluptuous curves. Still though, there are many, many roads to beauty and these fine, fit, hardbodies are certainly fit for our lust and, as we all should know, lust is a great motivator and, hence, a great source of inspiration.